The city-state’s crackdown on public alcohol consumption is meeting strong public resistance. Singapore is mulling a ban on alcohol consumption in public places in the face of fierce public opposition, The Straits Times reported this week. Under the Liquor Control Bill, tabled in the city-state’s parliament on Monday, the drinking of alcohol is forbidden in public places between 10:30 p.m. and 7 a.m. The bill, if passed, would also prevent retail outlets from selling liquor after 10:30 p.m. and designate areas with a higher risk of public disorder associated with public drinking as Liquor Control Zones. 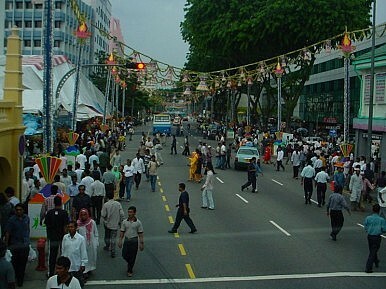 The move comes just over a year after the first riots Singapore had seen in nearly a half century broke out in the country’s Little India neighborhood following a fatal traffic accident involving an Indian national. The December 8 incident – which the government concluded involved alcohol intoxication – cast light on the link between alcohol consumption and public order, and is believed to have partly motivated the restrictions now being mulled. But the proposed ban is already being fiercely opposed by the country’s residents for varying reasons. While public opinion measures are difficult to come by, an online poll by The Straits Times found that 80 percent of respondents were against the new restrictions. Some balked at how the measures would further restrict their freedoms at home and further entrench perceptions of Singapore as a “nanny state” abroad. Several of the country’s news outlets also reported that the move has come under fire from liquor shop owners who worry that their businesses will be badly hit, and young clubbers who claim that the regulations will dull the nightlife scene at places like Clarke Quay, where many locals and foreigners gather on weekends to drink in open areas. Others have argued that the nationwide ban may come across as too harsh because there is insufficient evidence to suggest that it was necessary. National University of Singapore sociologist Paulin Straughan told The Straits Times that more data is needed before the public can decide. “What we need is to have data on the extent (to which) consumption of alcohol in public places was reported as public nuisance… If there is no problem, and something like that is slapped on us, of course, it will be interpreted as (being) very harsh,” she said. Some also say the fresh move to designate certain areas like Little India as Liquor Control Zones is discriminatory because it targets foreign workers who frequent these areas as their local hangouts. Jolovan Wham, the executive director of Humanitarian Organization for Migration Economics, said this amounted to profiling. “This, to me, has singled out foreign workers unfairly. By designating Little India and Geylang as Liquor Control Zones, that is profiling and it’s discriminatory…If it’s of such a concern, we need statistics to show that crime has resulted because of alcohol in these areas,” he said. But some lawmakers say that the nationwide ban is the only way to please residents, who often complain of noise and nuisance, because the negative effects of public alcohol consumption can only be curbed by toughening the government’s approach throughout the country. “An islandwide ban may be somewhat blunt, but I think it is necessary. This is because if the measures apply only to certain areas, drinkers will simply be displaced to other areas,” Tin Pei Ling, a member of parliament who sits on the government’s parliamentary committee for home affairs and law, said. Many expect Singapore to call elections at the end of 2015 or early 2016. Government restricts alcohol sales to “protect future generations”.